Battle of the Bands: Date 2 TOMORROW! New Initiative to Support Music! BATTLE OF THE BANDS 2018: Second showcase tomorrow - Saturday, Feb 10th! We had an AMAZING kick off week last Saturday, raising over $500 for MusiCounts, and filling the Roxy with music-loving friends, family and fans! 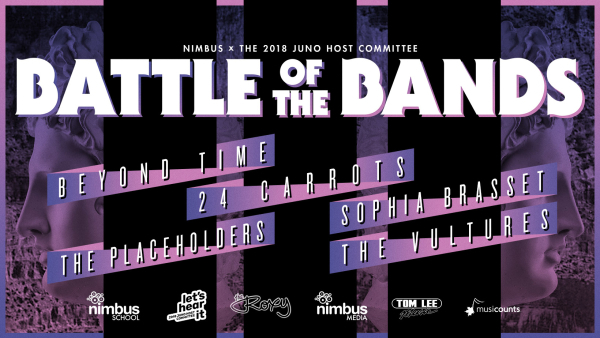 Tomorrow is the second date for the High School Battle of the Bands, a new competition that we have launched in partnership with the 2018 JUNO Host Committee, The Roxy, Tom Lee Music and benefitting MusiCounts. If you're still in the running as a high school act, this is a great opportunity for you to check out the venue, to see how the day is run, and get to know some other acts in the competition. If you've already played last week, we'd love to see you back at The Roxy supporting your fellow musicians! Judges include Lynn Ross (Cultural Planner, City of Vancouver), Alexis Young of Youngblood (SOCAN foundation, FACTOR and Music BC funded artist), Jess Vaira (local community champion and host of all-ages music nights in Vancouver), and Danny Craig (DEFAULT, Danny Craig Productions). The wonderful Tamara Stanners will host the finale on March 5th. The showcases after tomorrow will be on February 17 and 24 at The Roxy (doors at 2:30pm, music from 3pm-5pm). These All-Ages shows will feature five High School artists. A big thank you to the team at The Roxy for hosting these showcases and supporting all ages music. Door is by donation with all proceeds going to MusiCounts. More information about the final two weeks and the finale will be on its way soon, as well as some exciting news to all of you aspiring producers - we have another competition coming your way in the next few weeks! I hope you can all come along to support the next generation of our music industry!